Le Cateau is perhaps remembered for the loss of the 2nd Suffolks, there is a memorial to the men of the Regiment, who were part of the rear-guard who didn’t receive the order to retire. Despite being cut-off from the rest of the army, and being surrounded by Germans they fought to the last with only a small number escaping. Losses to the Regiment were shocking and it was some time before the Battalion was ready for action again. 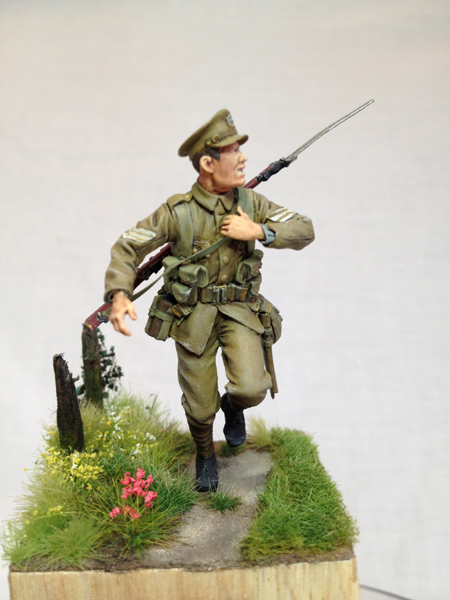 The pose of this figure shows the terror and uncertainty that the men of the Regiment would have known as he seeks to evade the encircling enemy.